Winner of the MFK Fisher Distinguished Writing Award from the James Beard Foundation. 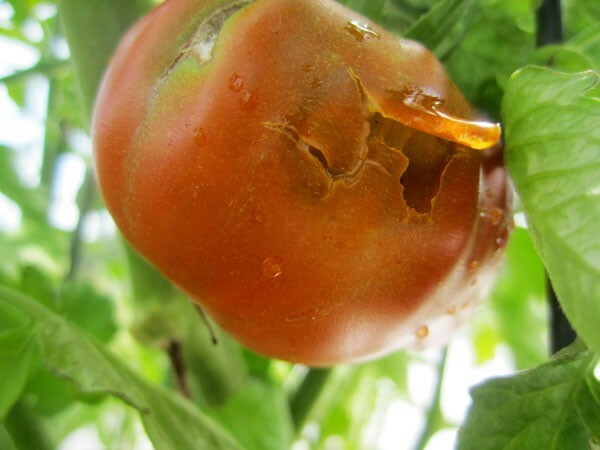 It starts every summer with the first ripening tomato. Maybe it's the early blush on a squat Cherokee Purple, or the lighter stripes of a Green Zebra turning pale yellow, or a lime Bush Beefsteak going gradually olive, then pink, then red. The effects of the sun on this single fruit carry the promise of summer, and the subtle message of whether it will be a good season for tomatoes, or even whether it will be a good summer overall. I watch the weather forecasts and gently squeeze with my fingertips to calculate the precise day I'll pluck it. But without fail—sometimes the very day before I plan for this auspicious moment—I'm foiled. I'll climb to the roof to find the fruit's smooth surface violated, chiseled and gnawed by a honed set of incisors. The marauder is insolent and indiscriminate. Sometimes the fruit is discarded, half eaten, on the roof. Other times it remains hanging on the vine. Now this tomato becomes a sign of war. And the hostilities will have begun in my annual jihad with Sciurus carolinensis, aka the eastern gray squirrel. It's a war I've never won. Last year the skirmishing started over a prolific yellow cherry plant. In late July I began to find the sweet mutilated marbles discarded two stories down on the front step. Others were cached in the soil of my cilantro bed. I found corpses every day until the escalation on August 1, 2011, when a low hanging, pleated red Brandywine was punctured and left hanging for the flies. But the assault on my orange Roman Candle paste-tomato plant was Pearl Harbor. For years I'd grown my tomatoes in buckets on the rooftop. It wasn't the best way to grow them, and my landlord didn't like it, but it's what I could do with the space. It worked if the conditions were right—just not for paste tomatoes. The restricted environment of the bucket isn't good for these varieties, and by late spring the tips of the new green fruit would be withered by blossom-end rot, a calcium deficiency that took most of them out. I don't bother with paste tomatoes anymore, but I'd mistakenly purchased the Roman Candle seedling. By midsummer, against all expectations, healthy green fingers began lengthening off the vines and I began to entertain impossible hopes of a novel, thick, yellow sauce tossed with freshly cut noodles. The most promising of these specimens turned a vibrant shade of banana by August 8—when near dawn it was attacked, ripped from the vine, savaged in its lower quarter, and mounted on the parapet of the roof like a severed head. I stood staring at the enemy's trophy, the familiar impotent rage rising. But the impulse to fall to my knees, gnash my teeth, and howl at the gods was stayed this time by a resolution I'd made earlier that spring. The squirrels may take my tomatoes and spit them back, but they would not go unanswered. The time had come to close the circle of life. This was bad. The assault on my orange Roman Candle paste-tomato plant was worse. At some point we stopped eating squirrels in this country. Certainly the very first Americans ate them in abundance, as did the first European settlers, who cleared the ancient forests and issued bounties on the rodent plagues that ravaged their crops; in colonial Pennsylvania authorities offered hunters three pence per squirrel killed. It was the colonists' skill in bagging them with their long-barreled rifles that gave them an edge on the Redcoats during the Revolution. In the mid-1800s mass squirrel cullings occurred in Indiana, Ohio, New York, and Kentucky. They often took the form of hunting contests in which thousands of animals were killed. Surely those squirrels wound up in the pots of community feeds. Different regions have different names for the massive stews simmered for harvest celebrations, some of which are still held today: the Brunswick stews of Virginia, the burgoos of Kentucky, the booyahs of Wisconsin, and chowders of southern Illinois. The recipes were similar, a thick, slow-cooked mishmash of meats and vegetables, more often than not featuring squirrel as the most important protein source. A well-circulated formula for Kentucky Burgoo Stew in the 1939 cookbook Fine Old Dixie Recipes calls for an astonishing 600 pounds of squirrel meat, "1 doz. to each 100 gals." City swells didn't turn their nose up at squirrel either, even though it's a member of the order Rodentia and cousin to Rattus norvegicus, the reviled plague bringer and urban menace otherwise known as the Norway rat. In Chicago in 1879, among the broiled sandpipers and black bear hams on the multispecies menu of the Grand Pacific Hotel's 24th annual Great Game Dinner, there were four preparations of squirrel, including black, gray, and an ornamental "Fox Squirrel in Arbor." On the eve of the Great Depression, the Chicago Daily Tribune's Jane Eddington offered a recipe for Brunswick stew, which called for three cleaned, washed, and jointed squirrels. She acknowledged the difficulty the average urbanite might encounter sourcing the rodent, suggesting chicken, lamb, or veal as substitutes, though coyly noting, "I know of people who shoot squirrels almost in the boundaries of some of our cities, even the largest ones." Even after the advent of processed and frozen foods, and disarticulated plastic-wrapped meat parts chilling under fluorescent lights, Americans kept eating squirrel, though you'd have to know a hunter to get any. A 1967 collection titled Game Cookery claimed that "each year well over 25 million pounds of this delicate meat appear on the tables of American households." That same year the Illinois Department of Natural Resources reported that hunters in the state had picked off over 2.5 million. Even the venerable godfather of American cuisine approved. "Squirrel has been written about rapturously for years," he wrote in his James Beard's American Cookery. "And it has long been associated with elegant dining as well as with the simple food of the trapper and the nomad. Fortunately it is plentiful." Beard's recipe for Brunswick stew called for two to three squirrels, veal stock, and a half cup of Madeira. But somewhere along the way, squirrel declined in popularity as a game animal, replaced by bigger quarry, such as deer and turkey, whose numbers had grown in the countryside as the number of humans dwindled. Mainstream views on squirrel eating began to drift toward disdainful—it became something hillbillies and rednecks did. 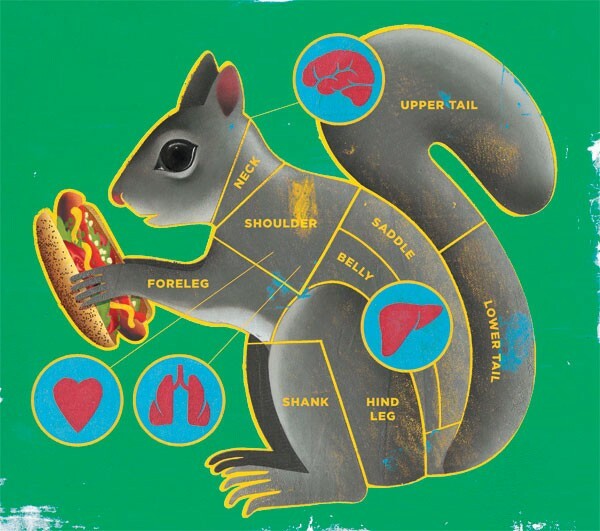 In the late 90s a pair of Kentucky neurologists posited a link between eaters of squirrel brains—a time-honored delicacy among hunters—and the occurrence of a variant of Creutzfeldt-Jakob disease, a theoretical but terrifying new mad squirrel disease. (Peer review later deemed this connection unlikely.) And though noted woodsman and Motor City Madman Ted Nugent devoted a few pages of his wild game cookbook Kill It and Grill It to "Limbrat Etouffee" in 2002—written with a vengeance he typically reserves for sitting Democratic presidents—when the 75th-anniversary edition of Joy of Cooking was published four years later, for the first time in the book's history it didn't include an illustrated how-to for pulling the skin from a squirrel. The west side is home to a great innovation in the taco arts. A James Beard award and three Lisagor awards were bestowed upon Reader staff on Friday. The rural pigeon has long been a valued food source, but what about its urban cousin? Garlic mustard threatens habitats across the country. One response? Weed it and eat it. What to do about the invasive weed garlic mustard--recipes and a cocktail included! Figuring if you can't beat 'em, eat 'em, a local fishmonger surprises ten hotshot chefs with a delivery of Asian carp. How do you cope with a sudden infestation of big, feisty crayfish? With a big pot of boiling water, naturally. At Stock, the cafe inside the new midwestern culinary mecca Local Foods, Abra Berens is giving new life to undesirable produce.